This post may contain affiliate links. If you purchase something through these links, I may receive a commission at no extra charge to you. For more information, see my full disclosures here. Thinking about starting a blog? Check out my post on how to start a blog to get started today. If you have a passion for recycled jewelry then you’ll love Wired. Chicago designer Melissa Kolbusz makes one of kind jewelry pieces from reclaimed and surplus industrial materials. 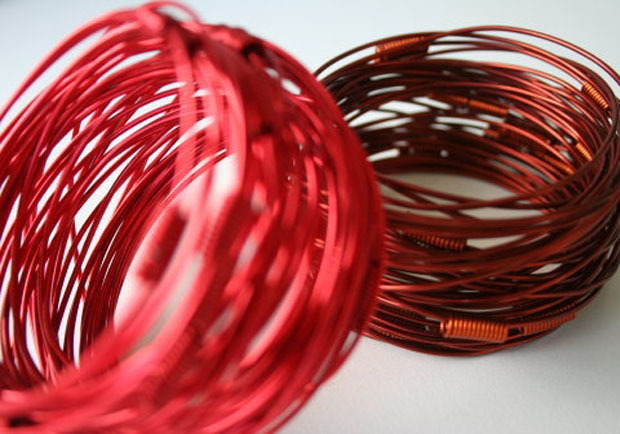 Whether it’s magnet wire or resistors; Kolbusz transforms these castoffs into works of art. “Wired” creations consist of bracelets, necklaces, earrings and rings. Kolbusz creates pieces for both men and women. Ranging in price from $25 to $285; we find these unique jewelry items affordable and a great gift idea for anyone interested in material reuse. You can purchase items at their website by clicking on Wired. Ruth LovettSmith is a freelance writer, artist, and designer with a BFA from the Massachusetts College of Art and Design. She believes that creatives can earn financial independence while following their dreams. Her goal is to help YOU grow your hobby, business, blog, and brand. She does this by sharing free tips, information, resources, worksheets, templates, and more. Join The Happy Creating E-mail Club! You are subscribing to the Happy Creating e-mail list. Unsubscribe at any time. I believe that creatives can earn financial independence while following their dreams. My goal is to help YOU grow your hobby, business, blog, and brand. I will get you there by sharing free tips, information, resources, worksheets, templates, and more. Join me in Happy Creating! Join The Happy Creating Email Club! Copyright © 2019 · The content of this website is by Ruth LovettSmith - LovettSmith Design, unless otherwise noted. Some posts may contain affiliate links. We are a participant in the Amazon Services LLC Associates Program, an affiliate advertising program designed to provide a means for us to earn fees by linking to Amazon.com and affiliated sites. Please see my FTC Disclosure and Terms of Service links above, for more information.